Warning: This article contains spoilers for the Game of Thrones Season 8 premiere – check out our review. Game of Thrones’ Season 8 premiere featured a number of long-awaited character reunions, and one of the most memorable scenes came as Arya finally came face-to-face with her old pal Gendry. But as viewers soon learned, Arya had more than simple gesture of friendship in mind. She wants Gendry to forge her a new weapon of some sort. Apparently, even two badass weapons aren’t enough for this trained killer. Judging from this picture, Arya seems to want Gendry to forge a spear-shaped weapon, or some kind of projectile. One end is clearly labeled “dragonglass,” so it’s obviously a weapon aimed at helping her kill White Walkers and wights. 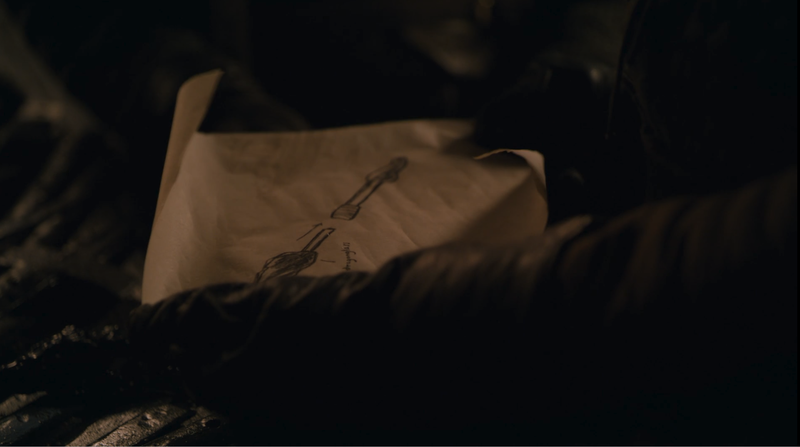 Arya already has a Valyrian steel weapon in Littlefinger’s Catspaw dagger, but since it’s only suitable for close-range combat, she may be looking for something that can give her more range. The blueprint design makes it look like this spear weapon can also detach into two halves. This would give Arya far more versatility in combat, allowing her to switch between a spear and blade at a moment’s notice. One of the trailers for Season 8 even shows Arya wielding something that could be this double-sided weapon. Weaponmaster Tommy Dunne teased this new weapon in an interview with Vanity Fair, saying: “There is one creation in Season 8 that is absolutely phenomenal. It’ll be a showstopper. That was great to finish. It was great to make, great to design it that it was about to be reverse-engineered and made into two different items. It’s also possible this blueprint is showing a staff that doesn’t simply attach and detach, but one that acts as a projectile weapon. While Westeros lacks the technology to produce guns, we imagine talented blacksmiths like Gendry can cook up crude projectile weapons given the right materials and blueprints, similar to the crossbows and dragon-killing ballistas favored by the Lannisters. Arya may want a weapon that looks to be an ordinary spear but will actually allow her to pick out a key target and snipe them from a distance. She does still have a few names to cross off her list, after all. Maybe she’s saving “the pointy end” for Cersei or the Night King. Even Daenerys may not be safe, given the frosty reception she’s been met with at Winterfell. There would be a certain irony in the idea of the Mother of Dragons being killed by a weapon made of dragonglass. There’s also something intriguing in the idea of Arya wielding a weapon that’s both fire (dragonglass) and ice (Valyrian steel). Is the “Song of Ice and Fire” a song about the death Arya creates when she unleashes her secret weapon? Fans have already taken to Reddit to speculate on the nature and purpose of this mystery weapon, with many agreeing that Gendry might be building Arya the closest thing Westeros has to a rifle. User pervocracy believes the weapon is an atlatl, an ancient projectile weapon that basically uses a stick-like object to launch a spear farther than a human arm can throw. User breezyceezy speculates that Arya will use the weapon to assassinate Cersei, all the while wearing Littlefinger’s face in order to get close enough to take her shot. Meanwhile, WEB_daboys suggests Arya might be planning to shoot down Viserion, robbing the Night King of his most powerful weapon. What do you think Arya is having Gendry build? Is it a projectile weapon or something more strange? And who is she trying to kill? Let us know your theories in the comments below. And for more on tonight’s new episode, check out our review of the Season 8 premiere.